For the past 40 years, Bruce has worked in cemeteries on the North Shore of Boston. Both as the owner of a retail monument company for 25 years, and as an expert independent monument engraver, he has carved every conceivable type of cemetery lettering, matching lettering types existing on monuments previously set on family lots. Born and raised in Peabody, MA, Bruce was educated at the Stone Trades School of Barre, VT after graduating from St. John’s Preparatory School, Danvers, in 1972. 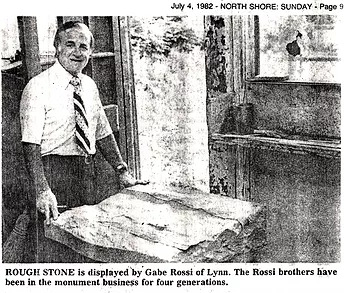 He did his apprenticeship in 1977 with the guidance of his father-in-law, Gabriel P. Rossi Sr. at Rossi Brother’s Monument Company in Lynn, under the watchful eyes of patriarch, Peter Rossi. Peter was known as one of the premier hand-tooled stone artists on the North Shore in his days and gave valuable personal knowledge to Bruce in those early years. "I can assure you my carving techniques will guarantee your loved one's name will be here on earth for centuries showing that 'we walked this way once...' The carving of one's name into stone is a lasting and final tribute. I fulfill that responsibility very seriously and take pride with your confidence in me." Subsequently, Bruce began subcontracting to several major memorial companies on the North Shore before purchasing Mount Pleasant Memorials in Gloucester, MA with his wife, M. Theresa (Rossi) Lane, in 1986 after the birth of their daughter, Joni. From 1986 to 2010, while raising his family, which now included his son Jonathan, he broadened his customer base, becoming a bronze restoration and granite cleaning specialist, and was sought out for his quality work; traveling as far west as Wisconsin and as far south as Virginia. During his time as owner of Mount Pleasant Memorials, Bruce proudly contracted to provide large veterans or commemorative bronze and granite memorials in the Massachusetts communities of Peabody, Beverly, Gloucester, Rockport, Rowley, Danvers, and Manchester-by-the-Sea with 100% satisfaction and referrals. His professional competence continued to be recognized by consistently being chosen for elaborate architectural projects, through the legal bid process. ​Upon selling Mount Pleasant Memorials in 2011 he is now able to pursue his passion of cemetery lettering as an independent contractor direct to the consumer. Empowering the family to deal direct with the letter cutter gives them the confidence that the work will be done exactly as they want, with the proper guidance from the most knowledgeable person available to them. Because you choose to deal direct there will be considerable cost savings along with personal service. Bruce works with brand new, state of the art, equipment to match any lettering style, and can give same day service. He will go to your cemetery lot, speaking to you directly from there if necessary, prepare stencil on site, do the work, and call you upon completion. You are not expected to pay for services until work is completed and you are 100% satisfied.